Hey there, gals and guys! 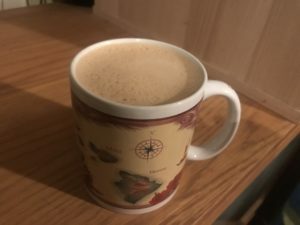 First post out in this section is my favorite “breakfast” when I´m slightly hungry or feel the need for some nutritional energy in the morning – a frothed mug of deliciously fat rich coffee! Make sure You use organic coffee, as most of the standard brands are loaded with pesticides, and Your choice of light, medium or dark roast. Being a Swede (we have the second highest coffee consumption per capita worldwide, just Finland beats us) I naturally prefer the darker roasts and I highly recommend trying different varieties to find Your favorite blend! Remember, coffee is serious stuff ??? Just put all the ingredients in a high container and blend them with a hand mixer on relatively high speed to create some beautiful and delicious froth on the surface – done!!! Only thing left is to pour the brew into Your favorite mug! It´s just super easy – washing up the utensils is actually the biggest part of the gig, unless You have a dish washer ?